Recently, I’ve been receiving lots of Questions regarding the nature of 2016 Uniuyo Post UTME. Looks like am not very busy today. I am going to provide answers to some of the questions often asked regarding the Uniuyo Aptitude Test Exams. What is the nature of the exams you’re going to be writing? Is it going to be a computer based? Is it paper and pencil based test? If I was writing this exam: I sure would love to know the answers to those questions. In this article, I want to enlighten you on the nature of University of uyo, Uniuyo post UTME. And I hope it helps. You can use the navigation below to browse through this page! 3 How will I know of UNIUYO Post UTME Announcement? 4 Sir, What about the Registration? 5 How do I arrive at Uyo and where do I stay? 7 What is the nature of Uniuyo post utme test exams? 8 How do I prepare for Uniuyo post utme test exams? 9 Is Uniuyo Post UTME Computer Based Test or Paper and Pencil ? 10 After the Exams what next? 11 After Admission what next? Before you apply the Uniuyo post UTME exams, you are expected to have scored at least 180 aggregate in your JAMB UTME. You should also ensure you have the relevant O level certificates. The University of Uyo usually announces the commencement of her Post UTME Examination toward the middle of the second semester of every session. How will I know of UNIUYO Post UTME Announcement? The University of Uyo always make both internal and external announcement of their post UTME Exams. The information is always published in National Dailies, like Punch, Daily Sun, Pioneer etc. Also the information will also be available on websites like www.uniuyoinfo.com, as well as radio and television. Are you still sceptical about when UNIUYO Post UTME will be announcing? Why not stay in touch with us by subscribing to our free sms alert 2.0. Sir, What about the Registration? After purchasing your UNIUYO Post UTME scratch card, you are advised to visit a trusted online registrar to submit the registration for you. You can do it alone if you think you will not make mistakes. This is the website for registration: http://uniuyo.edu.ng/. Registration will require recent passports photograph and your personal details. 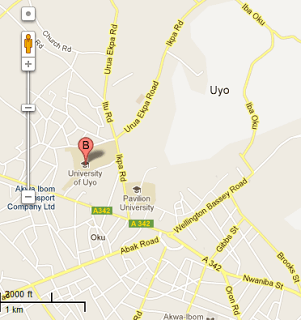 Wherever you are, you can contact our trusted agent for UNIUYO PUME online registration. After registration, you are expected to print out the exams slip which will qualify you to even enter the exams hall. Make photocopy of this slip because it contains vital information like the result checker code number and login details. How do I arrive at Uyo and where do I stay? Ok, Uyo is located in the South-South Nigeria, just after Abia state if you are coming from either the West or the East or North. Uyo is a very hospitable place to stay with its nice terrain and infrastructures. Here the weather is nice and the environment is peaceful for studies. In most state capital, there are buses that can convey you to Uyo without stress. On arrival at Uyo, you can go the University of Uyo hostel and apply for free temporary lodging which is usually one day. (update: There’s no guarantee you will get it). If you will need a place that is comfortable, you can meet our trusted agent in Uyo here prior to your arrival. He will be able arrange a nice and affordable accommodation for you. The total duration of the exams is usually one (1) week, usually Monday – Saturday. The dates for exams depend on the subjects. This information on the exams subject and venues will be printed on large format and displayed on strategic locations like the gate of the university during the exams period. On arrival at the University, All students are always assembled at the Central Bank of Nigeria Building (CBN) for a brief orientation by the Registrar and University management and subsequent commencement of the exams. What is the nature of Uniuyo post utme test exams? Uniuyo post UTME exams comprise 100 questions, that is 25 questions in English which is compulsory for all candidates, 25 each for the remaining subject combinations relevant to your course of study. For instance you applied for Medicine and Surgery; you are expected to answer 25 Use of English Questions, 25 Biology, 25 Physics and 25 Chemistry questions respectively. The time frame for this exam is usually 1 hour. From the word START, you will be expected to finish the exams at the STOP command. Failure to adhere to this may lead to automatic disqualification. So take note. You will be required to submit your answers alongside with you photo card and not less than two passport photographs. How do I prepare for Uniuyo post utme test exams? Uniuyo post utme exams is just like other exams and definitely need preparation. You can make use of the resources of this website to enhance your understanding of the exams. You can also purchase Uniuyo Post UTME past Question and Answers. It contains past questions up to date from inception till date. It could be a very nice resource since they sometimes repeat questions from year to year. Is Uniuyo Post UTME Computer Based Test or Paper and Pencil ? For now, Uniuyo post utme test exams is paper and pencil. May subsequently, they may adopt the current computer based testing method. If there are changes in this exams format, we will communicate to you. You will be given a question paper OMR paper and you will use Hb pencil to shade your details and your answers. The question papers are of different types just like JAMB. After the Exams what next? After UNIUYO Post UTME exams, the result will be out online at http://uniuyo.edu.ng/ . Enter the login information contained in the photocopied slip and get your result. Ofcourse, as you would expect, you will rejoice. Cheers! You will then be faced with the decision that will affect your entire life. If you decide to be serious in your studies, you surely will reap the benefit and vice versa. We wish you the best of success. Remember to share this info with your friends. Write a response…pls I want to study law at uni Oyo……what is the city off mark for it this year??? Pls have they announced the new schedule date for post utme exams? After the post utme registration,i knw dat my screening is on 15th and it is cancel, can i still go for screening on dat 15th? Now that uniuyo has cancel post utme registration… Will the give out admin soon tru jamb or will we still write post utme? Pls sir am intending to read political science in the university of uyo,and i scored 188 in jamb,so sir wht is the accepted cutoff point in de apptitude test to qualify me in my course????? What of those that are awaiting wace or neco result, will they still be accepted, now that the result is not yet out and screening is about to commence, what will they show on the screening day. Awaiting result will be accepted, as long as the result would be ready before the actual screening of results. What you are about to partake is an examination! Wow pple say if ur not informed ur deformed….. your informative,I enjoys it alot .thanks. Sir if I have a print out of my waec result instead of my school’s statement of result would it b accepted temporarily? ?